#DevCentral will be ramping up our social activities in 2018 and we wanted to share some of the media channels you can join to stay connected and engaged with the community. Did you know that the Twitter bird has a name? It’s Larry. And while dc’s blue ball logo doesn’t have a name, you can find your @devcentral team members @psilvas, @jasonrahm, and @JohnWagnon on twitter sharing their technology insights along with some personal daily happenings and thoughts. Stay connected for new articles, iRules, videos, the Agility Conference and earn additional DevCentral points for answering the question of the day! Don’t feel like reading anything and prefer to watch stuff? Then head on over to our YouTube channel for hours of instructional videos from our ‘Make it Work’ series, cool tech tips along with the awesome Lightboard Lessons. Lightboard Lessons are one of our most popular pieces of content and by subscribing to our channel, you’ll get the first alerts via email that a new video has published. You’ll probably even get to watch the video before it even posts to DevCentral. That’s right, early access. Prefer to hang out with the LinkedIn crowd? While the F5 Certified! 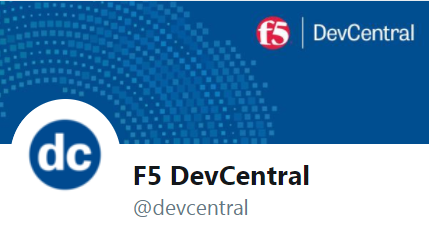 Professionals LinkedIn group is very active, the F5 DevCentral LinkedIn Group has been a little dormant recently so we’re looking to gear that up again also. With a little over a 1000 members, it’s a great way to converse with other members as we march toward the 12,000+ participants in Ken’s group. When DevCentral started back in 2003, it was one of the original ‘social’ community sites when social media was still in its infancy. Members range from beginning to advanced devs, industry thought leaders, and F5 MVPs. I’m also aware that there are BIG-IP discussions on Stack overflow, repos on github, the F5 Facebook page, MVP Kevin Davies’ Telegram F5 Announce and others. Where else should we engage with you and where should we be more active? Hit us up with the hash, #whereisdevcentral and we’ll meet you there.